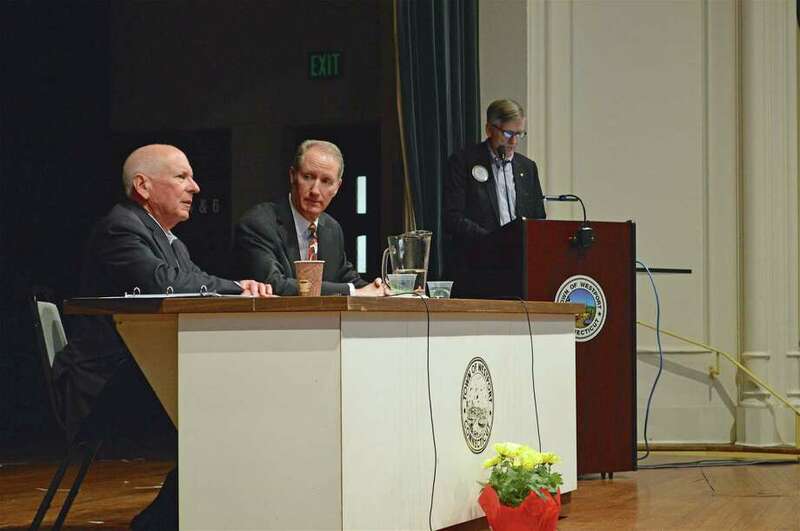 Moderator Jeff Weiser read questions for First Seletman Jim Marpe, left, and Board of Education Chairman Mark Mathias at the Rotary Clubs' State of the Town event held at Town Hall, Sunday, Feb. 10, 2019, in Westport, Conn.
WESTPORT — It was a Who’s Who of interested parties Sunday afternoon when the Westport Rotary and Sunrise Rotary clubs co-hosted a State of the Town discussion forum at the Town Hall auditorium, headlined by First Selectman Jim Marpe and Board of Education Chairman Mark Mathias. Both Rotary Club members themselves, each shared a pitch about the current state of affairs in their respective arenas, followed by a series of anonymous questions posed from an audience of close to 100 people, including a variety of elected and appointed officials. “There are 10 cards here and I’ll bet nine of them deal with Coleytown,” said Jeff Weiser, Westport Rotary president and deputy moderator of the Representative Town Meeting, who served as host. “We are resilient. ... Not only are we teaching that to our students, we are demonstrating it to our students,” he said, noting that the CMS challenge was going to make the town stronger and better off when it’s over. Mathias recapped events up to last week, when the Board of Finance and RTM denied the school board’s request for an appropriation to put portable classrooms at the five elementary schools to augment a change to a K-6 program there. Instead, both funding bodies approved a $1 million appropriation for portables at Bedford Middle School, potentially forcing the school administration to instead adopt a plan next year that will make Bedford a townwide middle school. “I’m pleased that we now are at a point where there’s some degree of certainty as we move forward,” said Marpe, who has helped organize a building committee to look at a timeline for getting CMS reopened. Marpe listed CMS as among the three most pressing items that keep him awake at night, along with ongoing fiscal challenges to the town and the specter of large multi-family house developments. He drew applause sharing the news that his office had filed for — and expected to receive — a four-year moratorium on new projects, following the opening of the apartment complex at 1177 Post Road East. “I want to assure you that our land use and public safety departments are doing everything they can to insure the appropriate quality of these developments,” he said, including a focus on safety and character of the neighborhoods. “Our funding and support from the state continues to be problematic,” he said, with expectations low for Westport to receive financial help in the near future. Federal tax reforms, he said, will also play a yet-to-be-determined part in the town’s finances, as they will limit state and local property tax deductions, which may make Westport less desirable as a community, he said. While he called the 1.07-percent increase to the Grand List, just announced, smaller than in the last few years, he assessed the town as remaining very desirable based on its amenities, schools, location and more. “I’m confident about where we are as a town and where we’re going in the future,” he said. Marpe shared a lengthy summary outlining a range of initiatives underway in town, including parking and paving, culture, traffic, and sustainability. One shadow he also mentioned related to the cost of recycling — something he said once had been a source of revenue. “This is a real concern as relates to the budget and our costs of dealing with the waste in this town,” he said, noting that while the town has trained itself to recycle, there is now a different and potentially complex side to it. Mathias, meanwhile, praised the public for its ongoing involvement in the school matters, in particular the CMS situation. “A highly engaged public is incredibly helpful to us,” he said.